Written around 1200 AD, the Orkneyinga Saga is the only major source of information for Orkney Islands in the eleventh and twelfth centuries. In the episode below, rule over the islands is shared by two earls: Rognvald Brusason and Thorfinn Sigurdarson, but the two have a falling out, leading to a naval battle in 1045 and more attacks in the following year. Earl Thorfinn was in such a fury that soon afterwards he sent men to the Hebrides and south to Scotland to gather forces. He gave it out too, that he meant to come to blows with earl Rognvald, and then take that without forbearance which he could not get when he sought for it in peace. And now, when this is told to earl Rognvald, that earl Thorfinn was gathering a force against him, he summoned his friends about him, and moots this with them, that earl Thorfinn his kinsman means to come to blows with him with a host and strife. He asked then what force they will furnish him with, and says he is not willing to lose his own without one trial of strength. But when he begged for their judgment on this matter then men gave it in very different ways. Some spoke after earl Rognvald, and said it was to be forgiven him that he did not wish to share his realm; but there were some who said it was to be forgiven to Thorfinn that he wished to have the realm for a while, when Rognvald had already had that lot which earl Einar had owned. They said, too, it was bad counsel that Rognvald should lay himself out to fight against Thorfinn with that force which he could get from two lots of the isles, when Thorfinn had a trithing and Caithness, and a great share of Scotland and all the Southern isles. There were men, too, who spoke, and said that a peaceful settlement must be sought, who beg that Rognvald would offer earl Thorfinn a half of the isles, and so in that way their kinship might still be saved. But when Rognvald found that each had a way of his own, but all were against his resisting, then he laid bare his will, and said that he will not cut his realm asunder by any settlement; that he would far rather give up the realm at once, and go to seek king Magnus his foster-brother, and look after what strength the king will give him to hold his realm. After that he makes ready for his voyage, and fares east to Norway, nor does he slacken his course before he comes into the presence of king Magnus. And when he is come thither, he tells the king the whole story. The king made earl Rognvald good cheer, and bade him be with him so long as he liked, and to take a fief of him so large that he could well maintain himself and his people; but earl Rognvald told the king that he wished he would give him strength enough to seek back his realm. King Magnus said of a surety he would aid him with strength to get what he asked. Rognvald stayed a short time in Norway ere he began his voyage west to the Orkneys. He had then many picked men whom king Magnus had granted him. And this went with him too; he [the king] sent word to Kalf Arni’s son, that he should have his lands and leave to live in Norway, if he would stand by earl Rognvald in this quarrel between him and earl Thorfinn. For friendship we shall surely see. Earl Thorfinn mans his ship with the best men he had left. After that he fares to find Kalf, and asked him for help. He said thus, that Kalf could not get bought back the friendship of king Magnus when he had already been forced to flee out of the land. All the sides with blood were dabbled. By his army was betrayed. And now that the main host had fled, then they, Kalf and Thorfinn, both ran aboard of earl Rognvald’s ship, and then many men of earl Rognvald’s fell. And when earl Rognvald saw in what a straight he was come, and that he could not conquer Thorfinn and Kalf both, then he made them hew the lashings asunder, and laid himself out to fly. This was late in the day in the day and it was beginning to grow dark. Earl Rognvald sailed at once that night into the open sea, and so east to Norway; he did not slacken his course till he came into king Magnus’ presence; he made him welcome now as before, and bade him be with him; and there earl Rognvald stayed a while. “I’ve made up my mind to sail with a single ship,” he said, “and the best crew I can get. My hope is that there’ll be no news of me until I arrive. Then it will either be, that we shall come upon them unawares, and then we may speedily win that victory which we should win hardly or not at all with a great force. But if they become aware of our voyage, then we will let the sea still take care of us.” King Magnus bade him fare as he liked, but to come back to him again as soon as he chose. And after that earl Rognvald makes ready his voyage and takes pains .in choosing men to go with him; and some of the king’s bodyguard made, up their minds to go with him; then he had a picked force. And when they were ready they sailed away to sea. That was about the beginning of winter. Earl Rognvald made Shetland from the sea; then he learnt that earl Thorfinn was in the Orkneys and had no very great force with him; he had then no fear of war in high-winter. Now Rognvald held on straightway south to the Orkneys. Earl Thorfinn was then in Hrossey, and had no fear for himself. But as soon as Rognvald came into the Orkneys he held on thither where he heard Thorfinn was, and came upon him so unawares, that nothing was heard of them before they had seized all the doors of the house which Thorfinn and his men were in. It was night then, and most men were asleep, but the earl sat then still drinking. Rognvald and his men bore fire to the homestead; but when earl Thorfinn was ware of the strife, he sent men to the doors and let them ask, who had sway over the strife. Then it was said that Earl Rognvald was come thither. Then men sprung to their arms. Then nothing could be done in the, way of defence, because outlet was shut to all. The house began soon to blaze. Thorfinn gave counsel that men should beg for leave to go out who could get terms of peace. And this was asked of the earl, and he allowed it to all women and unfree men, but said most of earl Thorfinn’s bodyguard would be no better to him alive than dead. So those men were drawn out to whom peace was given and then the whole house was soon burning. Earl Thorfinn broke away a wainscot panel at the back of o the house, and sprung out there; he had Ingibjorg his wife in his arms. The night was pitch dark and moonless, and he got away under the smoke, so that the earl’s men were not ware of him. He rowed at once that night alone in a boat over to the Ness. Earl Rognvald burned down the whole homestead, and all those men who were inside it, to whom leave was not given to go out. Now no man thought anything else than that earl Thorfinn had lost his life there. After that, Rognvald traveled to every part of the islands and laid them all under his authority. He sent also those words over to Caithness and to the Southern isles, that he meant to claim all that realm that earl Thorfinn had owned. No one offered any resistance. Earl Thorfinn was in divers places in hiding in Caithness with his friends, and no news went abroad that he had got away from the burning. Earl Rognvald sat in Kirkwall, and drew thither the stores which he needed to have for his winter quarters. He had a great band of men, and much good cheer. But a little before Yule earl Rognvald fared with a great following into the Little Papey to fetch malt, to be brewed for Yule. And at even, as they were on the isle, they sat long over a roasting fire, and he who made up the fire spoke and said that the firewood began to fall short. Then the earl made a slip of the tongue, and these were the words he spoke: “Then are we full old when these fires are burnt out.” But he meant so to have spoken, that they would then be full warmed. And as soon as ever he found it out, he said ” I have not made a slip of the tongue before this so that I call it to mind; it comes into my mind what king Olaf my foster-father said at Sticklestead when I took him up for a slip of the tongue: If it ever happens that I made a slip of the tongue I might make up my mind that I should then have but a short time unlived. Maybe that my kinsman Thorfinn is yet alive.” And just then they heard how that the homestead was girt round by men. There was come earl Thorfinn. They bore fire at once to the house, and laid up a pile of fuel before the doors. They allowed all to go out save the earl’s men. And when most of the men were drawn out, a man went out into the doorway in linen underclothes, and begged earl Thorfinn to stretch out his hand toward the deacon. But that man rested his hands on the balk of wood across the doorway, and vaulted out over the balk and the ring of men, so that he came down ever so far off’ all of them, and was lost in the darkness of night. Thorfinn bade them hold on after him, and says there went earl Rognvald, ” this is his nimbleness, and no one’s else.” Then they fared to hunt for him, and parted themselves into companies, and Thorkell fosterer went along the seashore to search. They heard how a dog barked among the rocks on the sea-shore. Earl Rognvald had his lapdog with him, and he betrayed the earl. They put him to death at once among the rocks, and it is the story of some men that Thorkell fosterer slew him, because there were no other men who would do it. But he had sworn to do all those deeds which seemed to Thorfinn more for his realm’s safety than otherwise. Thorfinn and his men stayed that night on the isle, and there all the train that had followed Rognvald thither were slain. But the morning after they took a ship of burden and laded her with malt. After that they went on board, and left the shields at stem and prow which Rognvald and his men had owned. They let, too, no more men be seen in the ship than had followed the earl. Then they rowed to Kirkwall. And when the followers of Rognvald who were in the town saw that, they thought that there earl Rognvald must be coming and his men; then they went to meet him, and most of them unarmed. Earl Thorfinn let them there take about thirty men and slay them. They were most of them of king Magnus’ bodyguard and his friends. The earl gave peace to one of king Magnus’ bodyguard, and bade that man fare east .to Norway and tell these tidings to king Magnus. From Icelandic Sagas and other Historical Documents relating to the Settlements and Descents of the Northmen on the British Isles, edited by G. W. Dunsent (Rolls Series v.88 n.1-4, 1887-1894). 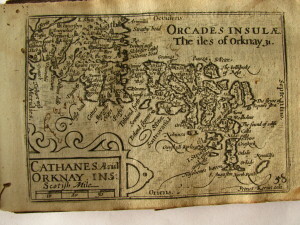 This entry was posted in Primary Sources and tagged 11C, Orkney Islands. Bookmark the permalink.